Though relatively new to the Shanghai intercollegiate sports scene, NYU Shanghai sports teams are no strangers to success. 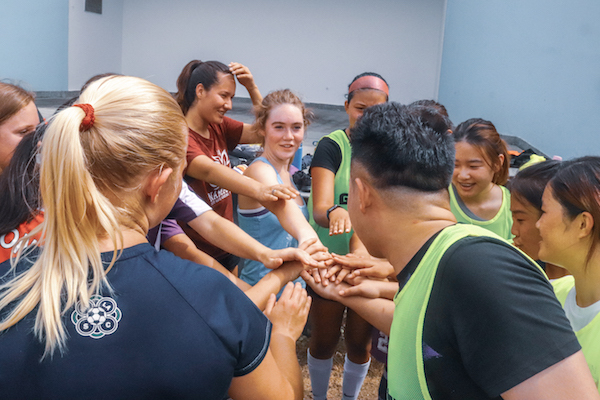 Last semester, the women’s soccer team won the Shanghai Intercollegiate League Championship. But this year, the university is hoping for success in even more sports. Around 200 students from all classes--including study away students from NYU Abu Dhabi and New York--tried out this year for a chance to wear NYU Shanghai violet and compete for their school on courts and fields across Shanghai and China. NYU Shanghai Women’s Soccer Team tryouts were held at the Yangjing High School Stadium to recruit more players for the new semester on Sept 8. Among the new teams this season is a 13-member women’s basketball team. Coco Deng ‘21, captain of the team, had played basketball throughout her school career, beginning in primary school. But the point guard’s playing career abruptly ended last year, when she arrived on campus as a freshman. Unable to gather enough like-minded basketball-lovers last year, Deng could not continue her passion for the sport on campus. “That’s why I was determined to build a team this year, now that I know the university better and have the skill set, confidence, and determination to make it happen,” she said. However, leading a team does not simply mean playing well on the court, Deng soon realized. The level of dedication and attention the team needed came down to many minute details such as checking attendance and filling out different forms. “At first, I thought all I had to do was to raise the team morale, but there is always unexpected work. It might be trivial, but it is still part of my everyday work,” she said. Finding athletes remains a challenge for some sports. The men’s volleyball team almost didn’t have enough athletes the day before tryouts until Jeffrey Lee ‘22 stepped in. After Lee kept personally inviting his friends and asking others to spread the news, his relentless recruiting efforts paid off. The team landed 10 members, and named Lee captain. Having kick-started weekly training sessions earlier this month, the team is eyeing their next friendly game against the Blue Whale Club in mid-October. According to Wang, more opportunities for inter-collegiate competition may be on the horizon for all NYU Shanghai teams since work is now underway to create a regional league of joint venture universities including NYU Shanghai, Duke Kunshan University, Xi’an Jiaotong Liverpool University and University of Ningbo Nottingham, and others. Justin Pataray, a graduate student in social work, practiced movements with a coach from Hongshang Muay Thai on Sept 20. Beyond team sports, the Athletics & Fitness Office has rolled out monthly fitness workshops including an introduction to Muay Thai. 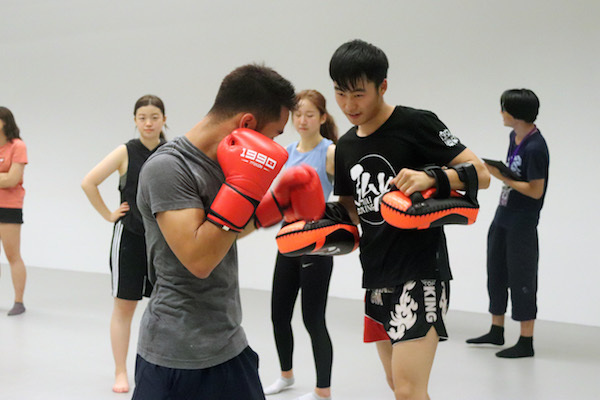 Thirty students joined a class led by Zhu Hongsong and his coaching colleagues from Hongshang Muay Thai--a leading Thai Boxing club in Shanghai--that included basic movements, self-practice sessions, and one-on-one training. With a large number of applicants for the Muay Thai workshop and positive feedback from participants, the Athletics & Fitness Office will continue to bring forward new fitness options over the next few months. This October, students even sign up for a class in Jeet Kune Do--the martial art form created by Kung-fu master Bruce Lee.